Using Quicken to manage your finances makes the process easier. This is made even simpler when you can connect your Quicken software directly to your financial and banking institutions to access your account. Digital tools range from paying your bills online to downloading financial transactions, and let you quickly import transaction data directly from your bank or other financial institution. This saves you the time and effort required to enter that data manually. Most financial institutions have some form of online presence, and accessing your financial information through the web and personal finance software is not difficult. However, not all institutions will directly interact with Quicken or allow it to download account and transaction data. These are generally the exceptions, and most major financial institutions offer this benefit. Does Your Financial Institution Allow Quicken Direct Connect? Intuit, the developer of Quicken software products, used to charge a licensing fee to financial institutions to permit transaction downloads into Quicken using its proprietary QFX download protocol. Financial institutions often passed this fee on to the customer. Most have stopped charging customers for Quicken transaction downloads. Check with your financial institutions before setting up transaction downloads to determine if you can do so for free, especially if you use a regional bank or credit union. 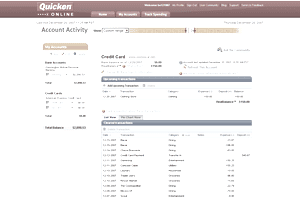 In Quicken, select Add an Account. Enter your financial institution's name. If it does not appear in the list, transaction downloads are not possible. You can also find out if your financial institution supports Quicken on the web by reviewing the Intuit OFX Connectivity page. Check your version of your product for a list of participating institutions. If one of your financial institutions isn't listed, you can still avoid manually entering transaction data using Express Web Connect. When Quicken attempts to connect to a financial institution that doesn't support Direct Connect, it will attempt to use Express Web Connect, which is the most common connection type. You can also automatically enter transactions and update balances in Quicken by logging into your financial institution account through its website and looking for a "Download to Quicken" link or button, or a link for "Web Connect." There are other methods for downloading and importing transactions yourself, including options for other financial software products, such as QuickBooks or Microsoft Money, and other file formats, such as a comma separated values file (note that not all file formats can be imported into Quicken). These options may be found in your account transactions view, in a side menu or at the bottom of the web page. You may also have the option to select a date range for the transactions to be downloaded. Some financial software users prefer to download their transactions using this method since the security of the data is entirely in their hands. However, whether you download directly into your software or do the work yourself, the data is always encrypted and is very secure. No one at Quicken ever sees your financial information.